We don't get to fly home to Alabama that often. And when we do, we spend most of our trip visiting family, which we miss terribly, since moving to Jersey. But, we also try to carve out a little time to visit some of our closest friends. There's never enough time! 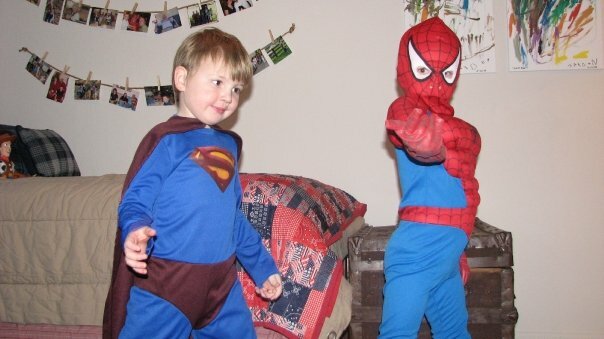 My oldest son's best friend, Drew (above pictured as Superman), is one that we always squeeze in. They met at church at age four after we moved back to Alabama from South Carolina in 2008. (yeah, we've moved a lot) They were instant buddies. And my son misses him terribly. As much as my son misses his little friend, we do, too. He was a riot. I'm talkin' laugh-so-hard-you-almost-pee-your-pants funny. But, he wasn't trying to be, which made him all the more hilarious. His adorable high-pitched voice (one of a kind) and the things he would say, we still talk about. This past Christmas, our schedules were crammed and we could only squeeze in a couple of hours for the boys to be together. My husband and I arranged to drop off our son at a nearby Chick Fil'A so they could grab lunch and play on the indoor playground. We left him with Drew's Mom, and a couple of hours later, returned to pick him up. If you know anything about Chick Fil'A at lunch time, the indoor playground is crowded. And it's little. So, it's loud. But, most moms sit at their tables outside the glass-enclosed playground, chatting away, totally ignoring the chaos. My son said, that at one point, he and Drew were inside one of the tunnels blocking kids from passing through, unless they knew the magic "password." Apparently, one mom, who was brave enough to enter the area without a hard-hat, noticed the boys were causing quite a traffic jam inside the jungle gym. "Umm, excuse me! Little boys inside the tunnel! You need to get out and let other kids pass through!" She spoke up again. "Little boooooys! You need to move out of the way!" "Don't make me go home and get my brand new paintball gun!" As you can imagine, that did not bode well with playground mom. "Little boy, do I need to go get your Mommy?" Snap. She threatened to get mommy. He knew he had no choice but to relinquish his power over the tunnel. As he turned toward my son and climbed out of the enclosure, he leaned in and passionately said, "She crushed our dreams, man." Now, I don't encourage any of this behavior and Drew's Mom was mortified when she found out what he had said. We told the boys they shouldn't have blocked the tunnel and they should have obeyed the mother the first time she asked them to move. But, you better believe that when the boys weren't looking, we laughed...our stinkin'...heads off. That's my home and I miss it! Hilarious story, Brianne! I recently started reading your blog, and I'll admit if it weren't for the Superman picture, I would have had no idea who you were talking about! He is one little cutie! We miss all of your guys. I got to see your little girl last time we were there. I can't remember why you weren't there, but I was sad I didn't get to see you!!! Thanks for reading! I am really enjoying it! Love you lady! And send me some funny pics of the kiddos or anything for my Friday Oh Snap! shots!! Love you gal!